This short series of presentations will attempt to answer some basic questions about vision. Why do we see in color? How did we get this way? Are there alternative forms of seeing? Are there colors that we don’t see? (Yes!) How long has this vision thing been going on? How did we come to our present notion of how we see? 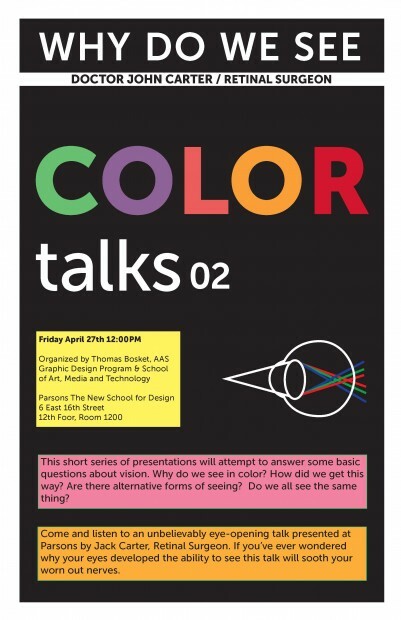 How does our perception of color affect what we create? Do we all see the same thing? We will explore these questions with the hope of creating for each of us a fuller, richer sense of what it means to see. Jack Carter is a retinal surgeon in Winchester, Virginia. For more than two decades he has been talking to people about what they don’t see that is in front of them, and what they do see that isn’t there. Beginning from this clinical experience he has developed an interest in understanding the subtle (and sometimes not subtle) differences in how people may perceive the same thing. These differences in visual perception may then go on to create very different notions of ourselves and the world we live in. Dr. Carter is the President of Retina Associates and has published in various journals of ophthalmology including the American Journal of Ophthalmology and the­­ Archives of Ophthalmology.